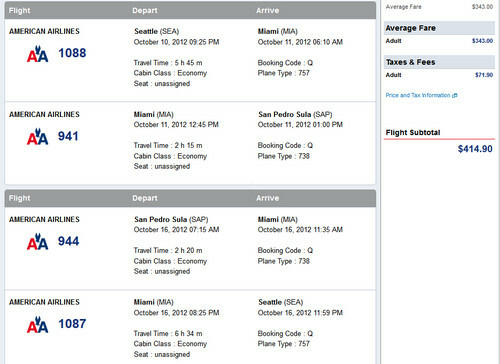 Yesterday’s sale to San Pedro Sula from San Francisco is also available from Seattle. Use this to visit Roatan Island, an easy 4 hour drive away. October 10th – 16th. Valid for travel from September 4th – February 7th, 2013 for Monday through Thursday departures. Use ITA Software Matrix Airfare Search and flexible month search to see availability with blackout dates from November 15th – 21st and December 16th – January 15th, 2013. Must purchase by June 22nd and 14 days in advance of departure.